NRA Basic Instructor Training is designed to develop NRA Certified Instructors who possess the knowledge, skills, and attitude necessary to conduct the NRA Basic Firearm Training Courses. It is the NRA class that helps people who already have subject matter expertise learn how to hold a class the NRA way so that their students earn recognized NRA certification. This course teaches you the policies and procedures for becoming an NRA instructor as well as effective teaching methods for training students. Basic Instructor Training is a pre-requisite for all instructor level courses. NRA Basic Instructor Training opens with an exercise on "How to Introduce a Speaker" designed as an icebreaker. You're paired with another Instructor Candidate, spend a few minutes in exchanging information, and introduce each other to the class. Immediately you start learning how to talk on your feet while we teach you how to offer useful praise and constructive suggestions. We help you conquer shyness and develop a communications bridge with a group of people who depend on you for positive instruction. Our classes establish an atmosphere in which your fellow students assist us in helping you succeed. All courses include the required NRA documentation, instructor guides, student packets, instruction and follow up support. You will receive everything needed to first take and then teach each course. Note: There will be processing fees payable to the NRA due upon the completion of class. Fee's are determined by how many and which courses you attend. This course is the mandatory pre-requisite for initial NRA Certified Instructor training. To be certified as an NRA Instructor, students must complete this 6-hour course that teaches material common to all NRA courses. 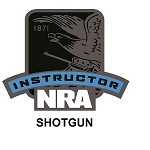 This course does not certify the instructor candidate to teach any NRA courses. Additional discipline-specific instructor training is required to certify instructor candidates to teach specific courses. After you successfully complete NRA Basic Instructor Training and score at least 90% on the Trainers Examination you should be ready for whichever discipline-specific instructor training class comes next for you: Pistol, Rifle, Shotgun, or Personal Protection depending on your qualifications and enrollment. You demonstrate your qualifications through the Pre-Course Qualification tests associated with the specific discipline. The first day of most NRA instructor training courses consists of this 6 hour Basic Instructor Training (BIT). Special Note for Current Instructors adding a rating: When adding ratings, instructors may be required to attend another Basic Instructor Training (BIT) Course if they have not completed that course within the previous 2 years.